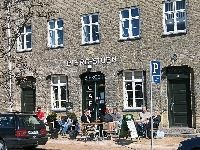 Situated on the border between Vesterbro/Noerrebro and the villa-quarters of Copenhagen, for many people Bispebjerg - or Nordvest - is simply a district that you drive through on the way to work. Dominated by industry and small companies, Nordvest is not a particularly pleasant place to live and it is considered one of the most socially deprived areas of Copenhagen, with problems with drugs and criminality and a lack of cultural activities. However, the city council is now starting a project to improve social activities and cultural life. Its small, low-cost apartments make the area popular with singles, young people and the unemployed.